As a municipal leader, you are charged with finding ways to more effectively serve and engage your city. Today, much of this happens digitally, with government websites having emerged as the dominant platform for providing information and services to citizens. Typically, people visit government websites to complete specific tasks – and they want to do so quickly, and increasingly from a mobile device. In fact, nearly half of all city website visitors come from a mobile device. If this number surprises you, it shouldn’t. Mobile traffic to government websites has steadily grown – up nearly 10 percent since 2016. If your website is not designed for mobile, half of your audience may be unable to find information, access services, or complete tasks. Not surprisingly, quick tasks like looking up information, making online payments, and finding events are most common on a smartphone; more time-intensive tasks like looking up public works information or applying for building permits are less common on a smartphone and more popular on a desktop. Finding information about parks and recreation programs was the top city website task overall, but was more than twice as common on a smartphone than a desktop. To keep pace with mobile growth trends, conduct user experience testing and website data analysis to identify the services that are most important to your community and which tasks are more common on a mobile device. Leverage these insights to create a service-centric website and ensure users can easily complete tasks any time and from any device. Once you’ve identified the most-common tasks performed on a smartphone, consider how you can enhance the experience. For example, build an app-like homepage display that features tasks specific to mobile users, which may be different than what is featured on the desktop homepage view. 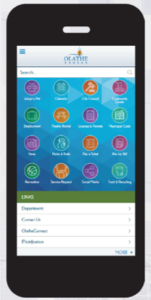 Take a cue from City of Olathe, KS – they used this approach to create a unique mobile homepage with customized icons for easy navigation to the most-common mobile tasks. Having a mobile-responsive website is no longer a “nice-to-have” feature but a “must-have.” With so many of your website visitors coming from a mobile device, it’s imperative to optimize the experience for mobile users and make sure they can easily access your digital content and services. More progressive cities are going so far as to make sure webpages that receive a high amount of traffic from a mobile device have a custom mobile-first view – meaning content blocks, photos and widgets are ordered in a way that makes the most sense to a mobile user and their specific needs. Social media, email, and text messaging are other channels that can be used to successfully reach a highly mobile audience. Consider using a notification solution that allows website visitors to subscribe to topics and receive an email or text alert driving them back to the website whenever new information is posted. Interested in more tips for optimizing your website? Download the whitepaper for a complete analysis of top tasks performed on city websites by device, including real examples from Granicus clients.